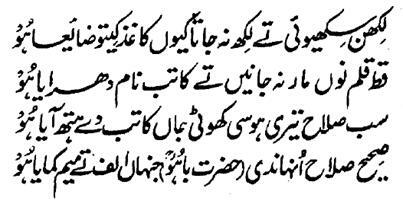 Hazrat Sultan Bahu Rahmatu-Allahe Ta-aala Alaihe says that 'O you who is proud on the Ilm-of-Outward (Outwardly Ilm)! You have learned how to write physically but as long as you did not know the manner of writing the Name-Allah-the-Essence (Ism-e-Allah-Zaat) on heart, you had been blackening the paper just for nothing. 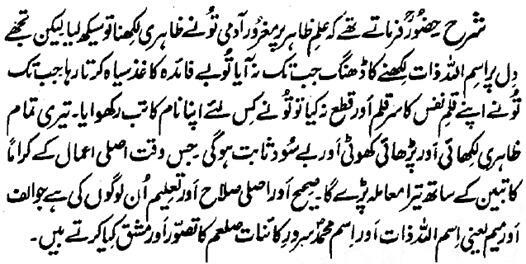 When you have not decapitated the head of the Nafs of your Pen and has not blown it away, why are you using the title of Scriber? All your Outward writing and learning will be proven fake and vain when you will face the Kiraman Katibeen of the real deeds. Valid and right goodness and learning is of those people who undertake the Exercise (of Preoccupation) and Visualization of the Alif and Meem, that is, the Name-Allah-the-Essence (Ism-e-Allah-Zaat) and the Name Muhammad Sal Allahu Alaihe Wa Aa-lehee Wa-sallam !